With two public lectures by invited guests on 1 March and 25 April 2019, the Digital Media Lab launches an interdisciplinary lecture series on contemporary issues in Artificial Intelligence. The talks are unified under the theme of transparency, epistemic and other, in AI. Beyond the deployment of ethics guidelines, current developments in AI pose challenges concerning the accountability and legitimacy of automated decisions and the legal and moral responsibility of actors, but also concerning the explanatory power of models of human cognition. 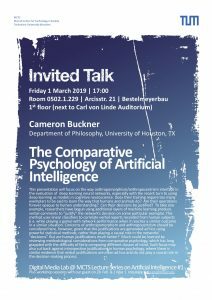 The honour of going first belongs to Cameron Buckner, Department of Philosophy, University of Houston, TX, who will give a talk on “The Comparative Psychology of Artificial Intelligence”. Abstract (English). Time: Friday 1 March 2019 at 17:00. Venue: Room 0502.1.229, Arcisstr. 21, Bestelmeyerbau 1st floor (next to Carl von Linde Auditorium). Plus workshop sessions on Thursday 28 February 10:00 to 18:00 Uhr (including breaks) and Friday 1 March 10-16 Uhr (dto. ), Room 2903.3.370, MCTS, Augustenstraße 46, Annex Courtyard, 3rd floor. 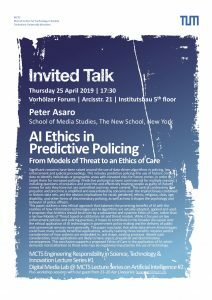 Second, there will be a talk by Peter Asaro, School of Media Studies, The New School, New York, on “AI Ethics in Predictive Policing: From Models of Threat to an Ethics of Care”. Abstract (English). Time: Thursday 25 April 2019 at 17:30. Venue: Vorhölzer Forum, Arcisstr. 21, Institutsbau 5th floor. This event will be co-hosted by the Engineering Responsibility Lab at MCTS, and opens its own public lecture series: Engineering Responsibility in Science, Technology & Innovation. All lectures will be held in English and are open to everyone interested. Both lectures will be accompanied by smaller workshop sessions with our guests. You are invited to contact us if you are interested in participating in the latter. This lecture series is supported with funding from the federal “Exzellenzinitative“ and adopts a critical perspective on current developments, in view of the aim of responsible AI design.